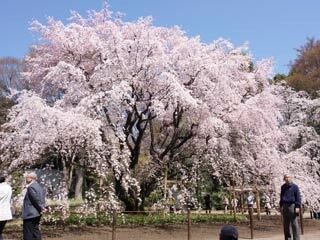 Shidare-Zakura, the weeping cherry, at Rikugien is one of the most famous Sakura Trees in Tokyo. In early April, it blooms beautiful flowers. Many people enjoy at Rikugien for the arrival of Spring. At night, it has a beautiful light-up Sakura, Yozakura when it blooms. Addmission: 300 yen for adults, 150 yen for kids. Opens: 9:00 to 17:00, but for the light-up season, they open until 21:00. No Hanami Party at this garden. But you can have lunch here.